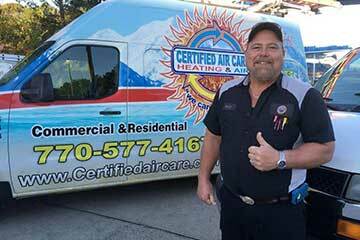 Certified Air Care is the trusted, go-to HVAC contractor for homeowners and businesses throughout Atlanta, GA for all of their heating, air conditioning, and refrigeration needs. We are a family-owned (Mark & Liz Brown) and operated business. 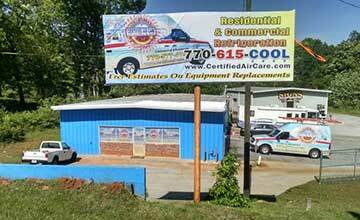 We've been in the HVAC business since 1982 and the Douglasville / Atlanta area since 1997. 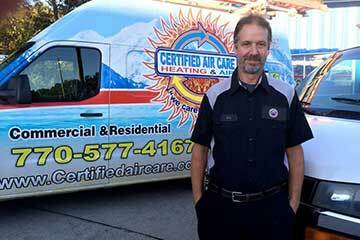 We are a quality-based business known as the guys to go to when you want your HVAC or Refrigeration job done right. For over 32 years we have been providing first-class heating and cooling services to our customers. 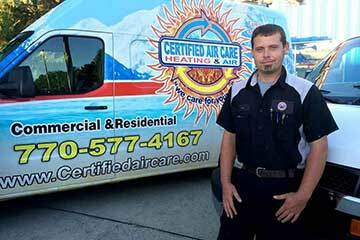 Commercial and residential clients can count on Certified Air Care for prompt, friendly service and maintenance. We are headquarted in Douglasville, GA but provide services throughout the greater Atlanta metro area - including 24 hour emergency services, 7 days a week. IACA Indian Temple, Pepsi, Rama Construction, Dallas ASI Center for Pain, Prestige Pharmacy, The Artemore Hotel, Cinema Tavern, Irish Bred Pub, Hamlin Homes, Hampton & Hudson, First Pentecostal Church, and more. You can always count on fast, honest service from Mark and his team. They truly work FOR the customer and are quick to respond when you need them. Thanks guys!